Skylights can bring in a great deal of natural light to brighten up a room. It is the reason we have seen a huge increase in skylight renovations. They are also a huge selling point for new home buyers. They save energy as it conserves on the use of lights being turned on and with the new types of window glass can stand up to the harsh climates of Toronto and the GTA. But what do you do at those peak hours when the sun is in direct alignment with the skylight and is allowing too much light in. The sun’s direct rays through a skylight are very powerful and can leave burn marks on furniture and discolor wood floors and carpet. The only solution is a window covering. With a skylight being much too high to open and close manually, how will you control the lighting it provides? 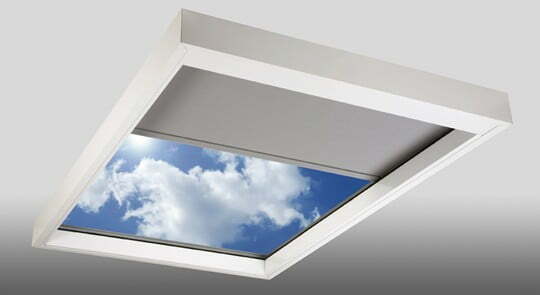 The answer is motorized shades for skylights and sunroofs by RoseSun Motor. The RoseSun company are experts in custom building and installing electric skylight blinds. With a flick of a button on a remote control you can open or close the blinds of your skylight. Or have a switch hardwired in to operate your motorized skylight shades. With the quiet RoseSun Motor technology you will never hear the motorized shades, but just see them in action. The installation of shades on a skylight will not only save money over time by adding a layer to defend against cold in the winter and heat in the summer but also give you the relief from direct sunshine. We often have customers that call us and say they love their skylights, but are bothered during the day when it shines too brightly and distracts them. Let us help you like all of our other satisfied customers in choosing an electric skylight blind that suits the style of your room. We have a large showroom open to the public with displays of our blinds, along with different colors and textures to choose from.